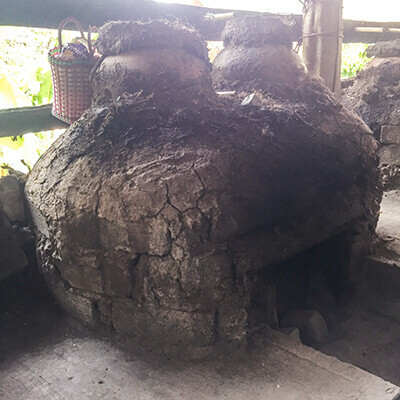 Clay pot distillation is common in areas like Santa Catarina Minas and Sola de Vega, Oaxaca. Clay pot stills are smaller than the copper potstills, and they’re known for imparting a soft, colloidal texture with a distinct mouthfeel. Unlike copper stills, clay pot stills do not use a condenser coil. When the clay pot still is running, steam from the heated distillate in the bottom pot rises into the upper chamber. On top of the upper chamber sits a copper saucer, where cold water is frequently added. The steam condenses on the bottom of the saucer and collects on a plate in the upper chamber. The plate runs the collected condensation out of the still.